I hope all of you had a great Thanksgiving! Thanksgiving itself was good since we weren’t cooking, but when we attempted some new recipes for just our immediate family yesterday, none of them turned out that well. The rolls were a little dense and not very flavorful, the pumpkin pie was very mediocre, and our oven started smoking while the apple pie was baking, infusing the pie with a horribly chemical-y smoke taste. It was truly awful. Kitchen failures are always disappointing because they are such a waste of both time and ingredients. Luckily, though, we did have a success: these cranberry bars. 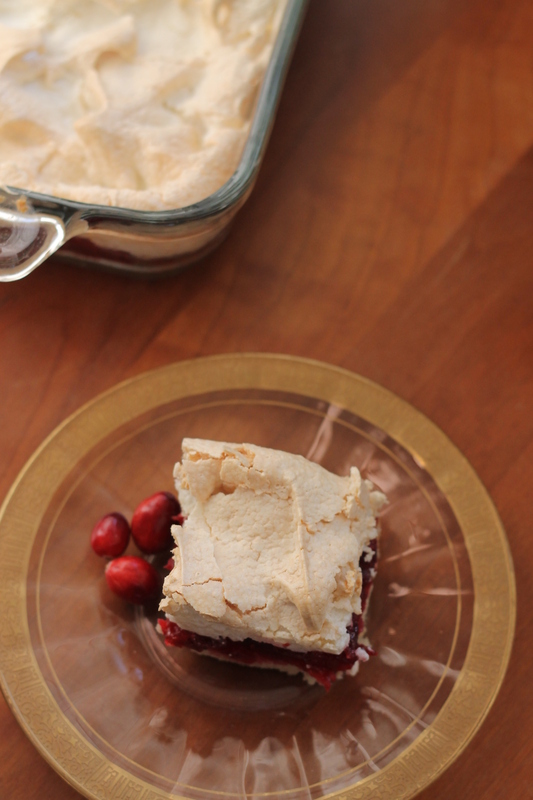 They have a basic shortbread base and are topped with a layer of cranberry sauce and meringue. It’s a great way to use up any leftover cranberry sauce in your fridge. We’d recommend using a slightly sweeter sauce for this recipe since it’s dessert and the shortbread isn’t very sweet. Homemade sauce really makes these stand out! Grease an 8×8-inch baking pan and set aside. In a small bowl, whisk together the flour and salt. In the bowl of a stand mixer on medium-high speed, beat the butter until light and creamy. Gradually add in the sugar, beating on high speed, until the mixture is very light and fluffy. Add the vanilla. Add 1/3 of the flour mixture on low speed. Gradually add the remaining flour until blended, scraping down the bowl with a spatula as needed. Press the dough into the prepared pan. Refrigerate for at least 30 minutes. Bake the crust at 350 degrees for 40 minutes or until dry to the touch (the edges should be slightly golden brown). Let cool on a wire rack for at least 5 minutes. Spread the cranberry sauce evenly over the prepared crust. Place the egg whites into the clean bowl of a stand mixer. Whip on high speed with the whisk attachment until foamy. Add the cream of tarter and beat until soft peaks form. Gradually add the sugar and beat until stiff (but not dry) peaks form. Beat in the vanilla. 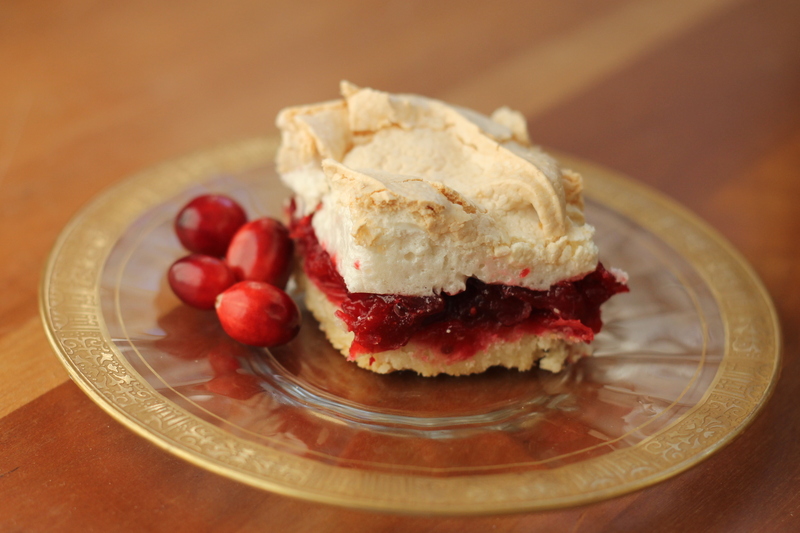 Spread the meringue evenly over the cranberry sauce. Swirl it with the back of a spoon to make peaks in the meringue. Bake for about 25 minutes or until the meringue is light golden brown. Let cool on a wire rack. Cut into squares and enjoy!